6.3.1897: Launched by Cochrane & Cooper, Beverley (Yd.No.177) for Thomas Baskcomb (22/64), Henry Lewis Taylor (21/64) & Thomas William Baskcomb (21/64), Grimsby as ALBATROSS. 6.4.1897: Registered at Grimsby (GY279). 6.4.1897: Thomas Baskcomb designated managing owner. 6.4.1897: Vessel mortgaged (64/64) to George Jeffs, Grimsby for the sum of £2500 with interest at 51/2% (A). 6.4.1897: Vessel mortgaged (64/64) to The York City & County Banking Co Ltd, York (B). machinery defect and returned to harbour. Fined a further £34 with nets and gear confiscated. 3.4.1907; Mortgage (A) transferred to Thomas Baskcomb (64/64), Grimsby. 24.4.1908: Thomas Baskcomb shares (22/64) and Henry Lewis Taylor shares (21/64) sold to Thomas William Baskcomb (64/64), Grimsby. 25.2.1908: Thomas William Baskcomb designated managing owner. 17.3.1908: Vessel mortgaged (64/64) to The York City & County Banking Co Ltd, York (C). 14.9.1910: Sold to Alick Black (60/64) and Rowland Hill (4/64), Grimsby. 15.9.1910: Alick Black designated managing owner. 5.11.1910: Rowland Hill shares (4/64) sold to Alick Black (64/64), Grimsby. 25.1.1911: Vessel mortgaged (64/64) to London City & Midland Bank Ltd, London (D). Pre 1913: Fishing from Fleetwood. 1.1.1914: Tonnage altered to 66.76 net under provision of Merchant Shipping Act 1907. 5.6.1914: Henry Croft Baker appointed manager. 28.5.1914: Sold to The Savoy Steam Fishing Co Ltd (64/64), Grimsby. 30.6.1914: Vessel mortgaged (64/64) to London City & Midland Bank Ltd, London (E). 9.11.1915: Sold to John Lawrence Green (64/64), Grimsby. 10.11.1915: Vessel mortgaged (64/64) to National Provincial Bank of England Ltd, London (F). 11.11.1915: John Lawrence Green designated managing owner. 24.9.1916: Stopped by U-boat (U57) approx 20 miles E of Flamborough Head and sunk by gunfire. 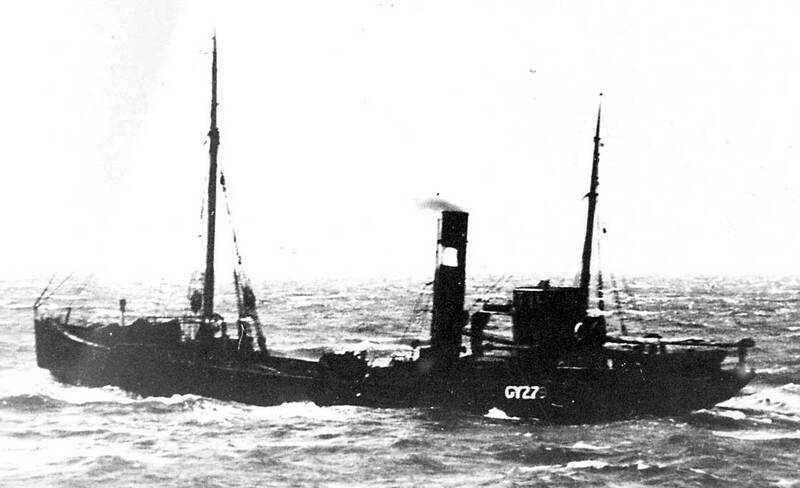 20.10.1916: Grimsby registry closed “ Vessel sunk in North Sea by German submarine on the 24.9.1916”. 30/06/2017: Removed FMHT watermarks from image. This entry was posted in Lost Vessels, Steam Trawlers, Steamers (Picture), War Losses and tagged Lost, No Fleetwood owners, War Loss on May 20, 2012 by Fred Smith.